monozygotic twins with varying extent of union and different degrees of residual duplication. The various types of union are named by the use of a prefix designating the region that is united and adding the suffix -pagus, meaning joined (for example, craniopagus [united by the heads], thoracopagus [united in thoracic region]); the various types of residual duplication are named by designating the parts duplicated and adding the suffix -didymus, or -dymus, meaning twin (for example, cephalodidymus, cephalodymus). 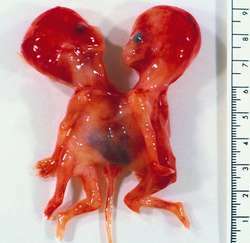 two fetuses developed from the same ovum who are physically united at birth. The defect ranges from a superficial anatomical union of varying extent between equally or nearly equally formed fetuses to one in which only a part of the body is duplicated or in which a small, incompletely developed fetus, or parasite, is attached to a more fully formed one, the autosite. Conjoined twins result when separation of the blastomeres in early embryonic development does not occur until a late cleavage phase and is incomplete, causing the fused condition. Viability depends on the extent of the fusion and the degree of development of the fetuses. See also Siamese twins. Monozygotic twins with varying extent of union and different degrees of residual duplication. The various types of union are named by the use of a prefix designating the region that is united and adding the suffix -pagus, meaning fused (e.g., craniopagus, thoracopagus); the various types of residual duplication are named by designating the parts duplicated and adding the suffix -didymus, or -dymus, meaning twin (e.g., cephalodidymus, cephalodymus). two deformed fetuses fused together.